I became interested in solar cooking - or at least the idea of solar cooking - quite a few years ago. Time passed and I was always too busy to get past the "just thinking about it" stage. Until last year. We were setting up our booth at craft shows every Saturday -- outside and usually in the very hot sun. And week after week, as I ate my sandwich, I always thought how nice it would be to have a hot, home cooked lunch. Last summer, as I was preparing for the season's craft shows, I decided to investigate solar cooking. WOW! Was I surprised! Not only was it not a new idea, it is a very old idea. Apparently this is a very popular cooking method around the world. But I had never heard of it. I decided that if native women around the world were smart enough to do it -- then I was smart enough to do it too! But at this point, I wasn't ready or willing to invest in a commercial product. 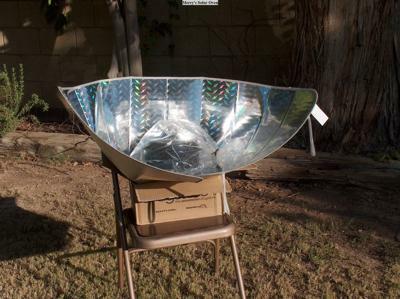 So I found a very, very simple plan to make a solar oven out of just a silver reflective windshield shade. Take the shade and pull it around into a funnel shape. Fasten the two sides together with duct tape or Velcro. Set the funnel shape onto a small cardboard box for support. Place a wire rack across the box (inside the funnel) to hold a pot. Place your food into a dark pot and place the pot in an oven roasting bag. Put this in the solar funnel. This was my first solar oven. The first meal I cooked was just a very simple lunch. It was just hot dogs cut into pieces in some canned chili. I had no other instructions and didn't know how long to let it "cook" or at least in this case, "heat up". I ended up taking it off just a little too soon and the hot dogs were not fully heated in the center. But it was warm enough! And we were hooked. Since then, I have successfully made beef stroganoff, beef stew, baked potatoes, dinner rolls, and even baked cakes ? all in this very simple, very basic solar oven. PS. I have now purchased a commercial oven, but I still use this simple little oven as well. And thank you for this great description of "beginner solar cooking". This is a great example of how easy it is to get started in solar cooking and to have great results despite the simplicity of the solar cooker. I could not tell if this was a recent post or not, but came upon it while surfing the site and thought, "this is a similar experience to my own a few years ago". Growing up in the land of shadows (NYC), I had no idea there was a Sun, much less other celestial objects. When I arrived in Las Vegas, I was stunned by the intensity of the yellow orb that our planet rotated around (it's rumored), and began experimenting with this seemingly endless bounty of energy. I built solar panels, charged batteries, and then found that the ultimate energy conversion was to cook with the Sun directly. I've shown dozens of people how simple the idea was, since that time, and it just never gets old. We've only got 4 billion years worth of solar energy left, so I'm glad to see that people like me are taking advantage of the time we have left.